Baltimore's city council is calling on Mayor Catherine Pugh to resign as investigators probe lucrative deals she negotiated to sell her children's book series. 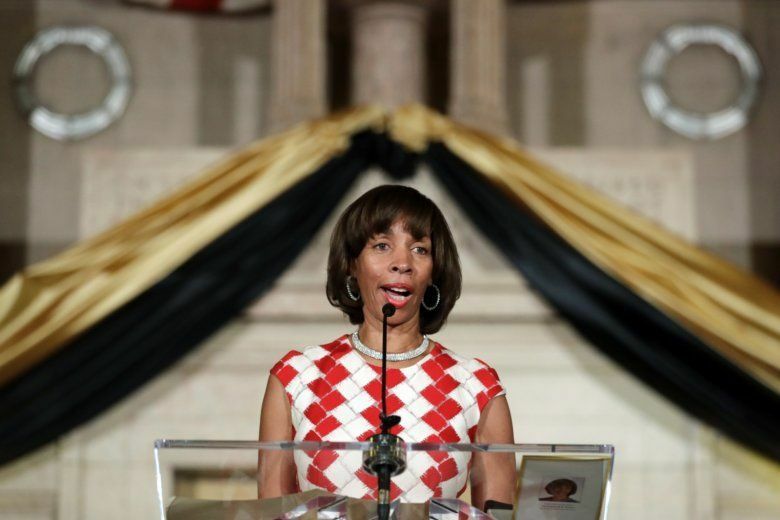 BALTIMORE (AP) — Baltimore’s City Council on Monday called on Mayor Catherine Pugh to resign as multiple investigations probe lucrative deals she negotiated over years to sell self-published children’s books to customers that included a hospital network she once helped oversee and a major health plan that does business with the city. Amid the latest image-tarnishing scandal for struggling Baltimore, the current lineup of 14 council members signed a letter urging Pugh to step down immediately, taking the only step it can to pressure the city’s No. 1 official out of office. The panel asserted it’s no longer in the city’s best interest for Pugh to continue as Baltimore’s 50th mayor. Acting Mayor Bernard “Jack” Young — the city council president who has temporarily departed the panel to take over Pugh’s day-to-day responsibilities — did not sign the letter. The 69-year-old Pugh is on an indefinite leave of absence, citing health reasons due to a bout with pneumonia, a lung infection that just contributed to the death of Maryland’s House speaker. In a statement after the council’s letter was made public, Councilman Ryan Dorsey asserted it was “beyond thinkable” that Pugh should return to a role in government. “If she has any ability whatsoever to put the welfare of the more than 600,000 residents of Baltimore City ahead of her own self-interest, she will not delay in offering her full resignation,” he said. Pugh has been under enormous pressure since it’s come to light that since 2011 the Democrat has somehow received payments totaling at least $800,000 for hard-to-find illustrated books with titles like “Healthy Holly: Fruits Come in Colors Like the Rainbow.” The questionable arrangements were first exposed by The Baltimore Sun, which last month revealed that Pugh sold books for $500,000 to the University of Maryland Medical System, a $4 billion hospital network she once helped oversee during her days on the state Senate. Pugh spokesman James Bentley declined comment on the council’s Monday letter, saying there was “no timetable” for Pugh’s return to City Hall. But he suggested it was only a matter of time. “When she gets healthy she does plan to return,” Bentley said in a phone interview. Pugh must decide if she wants to keep her job badly enough to grapple with the numerous lingering questions about her “Health Holly” sales and the significant fallout that’s left her increasingly politically isolated. Yet there’s no shortage of U.S. politicians who’ve recently hunkered down after high-profile scandals. In neighboring Virginia, for example, a series of scandals in early February dramatically upended state politics but there have been no resignations. While the numerous accusations raise clouds over Baltimore’s elected mayor, Pugh hasn’t been indicted for anything and it’s far from clear how long the criminal investigation by the state prosecutor’s office will take. The first-term mayor could try forging ahead, but many political analysts believe she would never be able to wield power effectively. Yet over the weekend, revelations raised new questions about Pugh’s account of how the books came to the hospital system’s attention. John Ashworth, interim leader of the University of Maryland Medical System, on Saturday told Maryland lawmakers that it was Pugh who “approached us” about her slim children’s books. “She had direct conversations with the president and CEO at the time, and possibly others. But we need to look into that even more to make a determination about how all of that occurred,” Ashworth testified before the Maryland House’s Health and Government Operations Committee. “I recall passing the time by thumbing through the first book before an UMMS meeting. One my colleagues loved it and thought it would help advance children’s health,” she said in a statement. In recent days, Johns Hopkins Health System disclosed that Pugh, during her days in the state Senate, once approached a senior health system employee to buy her illustrated books. The employee declined.